Hurricane Florence is holding at 140 mph winds and now showing up on the edge of our water map. 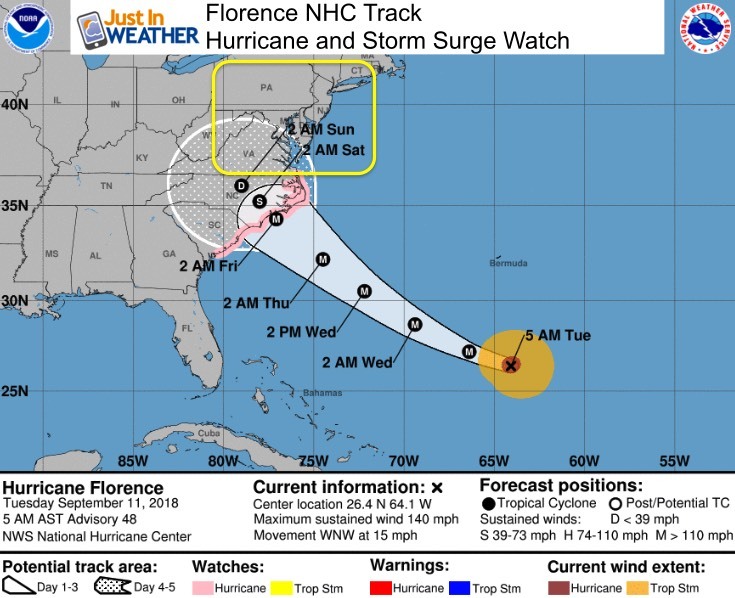 In addition to the States of Emergency from Maryland down through South Carolina, not Hurricane Watches and Storm Surge Watches have been issues. More on that and our local expectation below. 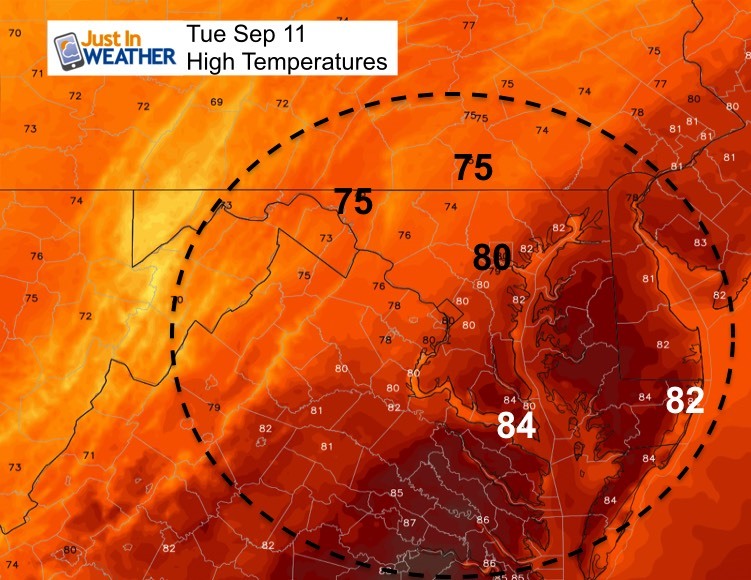 But first, we have thick fog this morning and some showers and storms this afternoon not connected to the hurricane. While winds remain at 140 mph, there is a chance this reaches Category 5 briefly today. 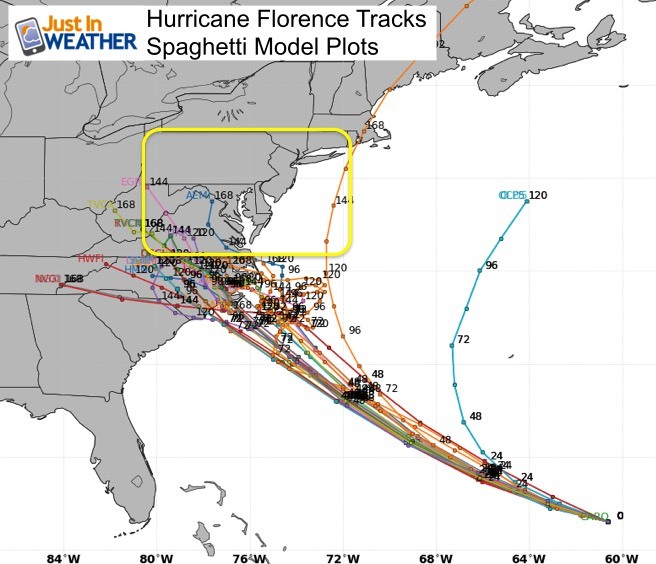 The track is still locked in on North Carolina… then expected to stall or crawl inland. 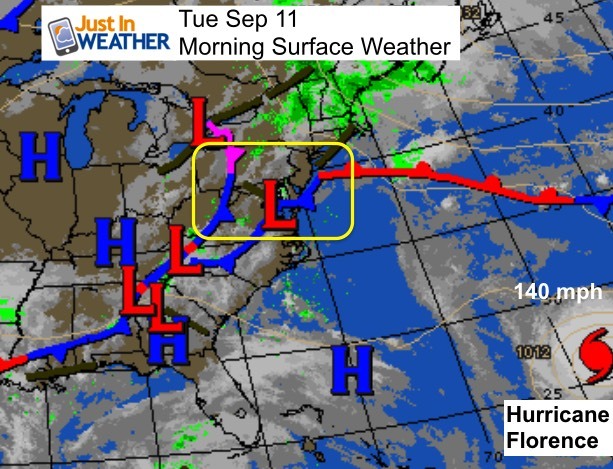 That wil determine if rain can reach Maryland and in the path who may get 10, 20, or even up to 30 inches of rain. HWRF Shows Hurricane Florence making landfall just north of Wilmington and then nearly stalling for two days, then pushing west. 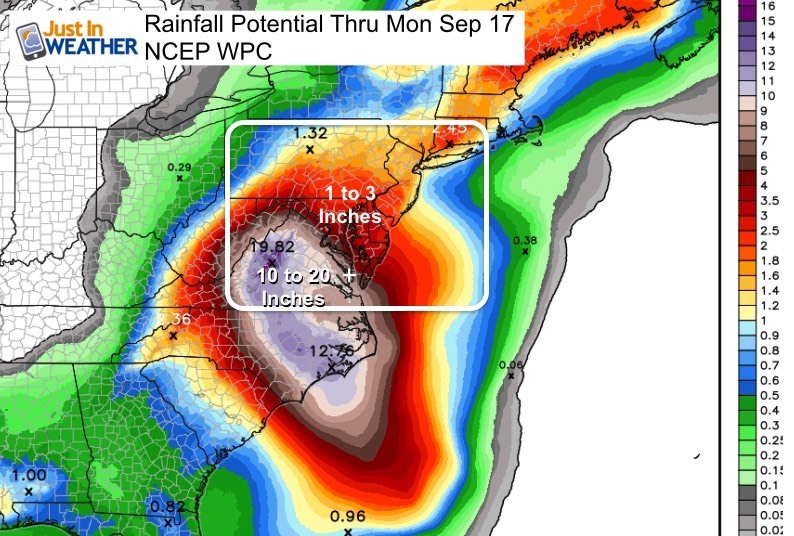 That could dump over 20 inches of rain there and limit the impact north into Maryland. 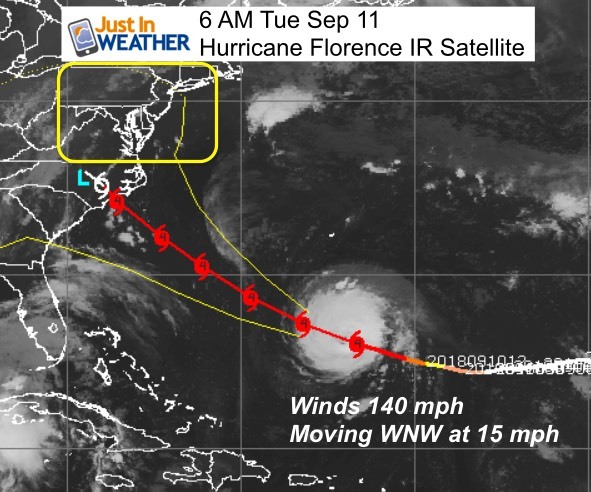 The track of Florence is similar to Isabel (2003), but instead of moving inland in a hurry, this will crawl or stall. That may limit the surge of water up the Chesapeake Bay, but water levels are already high with flooding. There wil be more flooding as tides will not be allowed to drain out. Watching if and where this crawls will determine how much water may or may not push north. We are on the edge. Winds: Southern Maryland and Ocean City may get gusts to 35 mph, but the bulk of the storm impact will remain south. 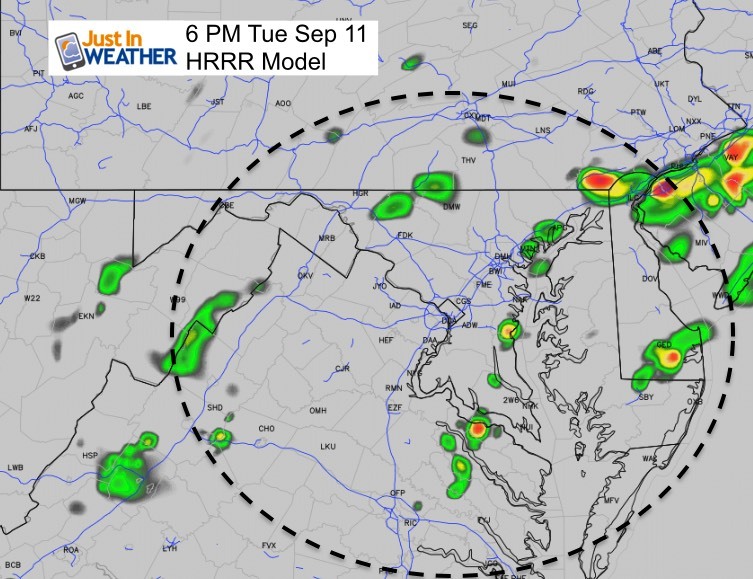 Rain: Depending on the craw and stall, the edge of the rain bands will clip our region with some areas near and north of Baltimore possibly staying dry. In fact the sinking air around the edge of the storm on Thursday might make it nice briefly before the east winds brings back the moisture. We will be in for a chance of rain through next week. This shirt was designed by my ‘bonus’ daughter Jaiden. All proceeds will go to Just In Power Kids and free holistic therapy for kids in and post cancer treatment. Choose flat fee or FREE along with a spirit wear shirt fundraiser that earns your school money. We are still taking donations for our best Maryland Trek yet. Every penny goes to Just In Power Kids programs to provide FREE holistic care for kids in cancer treatment and up to 5 years post treatment. Partner With Us. My wife Shannon and I started this non profit Just In Power Kids. We are building a network of Integrated Wellness Practitioners plus funds for kids in and post cancer treatment to get free sessions.